�������������� �� CAD ������ ���� �� ����� ��:IGES, STEP, ACIS, PARASOLID, CATIA, Pro/Engineer, Unigraphics, SolidWorks, AutoCAD, STL. 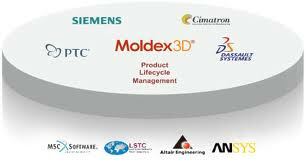 ������ � Moldex 3D �� ������� � CAD Rhiniceros, � ����� ����� �� �� ������� ������ ������� CAD �������, ����� ���� ���� �� ���������� � Moldex 3D. ���� ��������� �� �������, �������� ����� �� �� ���������� � ANSYS, HyperMesh, FEMAP, IDEAS, MSC.Nastran, Pro/Engineer � �� ANSYS Hypermesh I-DEAS MSC.Patran Pro/Engineer.